This is the city I fell in love with. And honestly, it was not so much the city itself that I fell for. It was the people, the part I got to play in others lives, the lessons God taught me, the community I lived in, the way I saw Jesus moving. The city represents something new in my life. I keep asking myself why am I doing things? What is the point? Am I being obedient? Sometimes the answers to those questions awaken me. Sometimes they excite me. And sometimes they slap me in the face. The process of processing is slowly happening in my life and well, I’m not real sure how to word it because I don’t quite get it myself yet. But, I do know that God is moving and sovereign and has a lot in store for myself and the people I met this summer: staff, hosts, homeless, and youth. I am astounded by how well He knows me and my needs. This morning I ran into a lady from the church I grew up in. We chatted a moment about what God was doing and then prayed together. Then, I had a question for one of the other hosts and they asked me how I was and then challenged me with some stuff we had talked about this summer. So whatever you are trying to process through right now just know that He knows your needs. Seek Him and He is so ready to encourage you and love on you. Amazing testimony of a life transformed! What an amazing testimony! Learn how YOU can minister in urban centers with CSM! short-term and long-term change in Chicago! team with City Directors like Tim and Kelly through financial or prayer support! serve with CSM in Chicago and make a difference at ministry sites just like Uptown Baptist! The following is a trip reflection written by a great CSM group leader. This was an all adult group that served this past summer with CSM in New York City. Big thank you to them for allowing us to share their story! We'll share more reflections from this group later on as well. The mission trip in August enabled us to see what life is like for those who live and work in New York City. We intentionally focused on those in any sort of need. I was inspired by the faith, the hope and the love of the leaders of each of the ministries we visited. We saw how one or two people had begun a feeding ministry and how their little mustard seed of faith in action had become a giant tree offering food and other support regularly to many people. Like Jesus, they had responded to the needs of the people around them. One ministry is sponsored by Pastor Larry. He offers dialogue and communication with non-Christian immigrants so that they can learn about Christianity, but he does not proselytize. He establishes contacts by offering English language instruction and other useful services. He wants to reach out in love to others who have a different faith so that they can know more about us and we about them, in a non-threatening way. He walked his talk; he used his living room as a space to welcome people. Mission trips allow transformation to take place. The eight of us who went have been transformed by what we experienced: by what we saw, heard and did. We want to share some of our experiences with you in hopes that you also may be transformed. It is the same as Jesus sharing the Good News with his disciples, and through the ages this Gospel has been passed on to us. CSM Washington DC has the awesome opportunity of serving with a variety of outstanding ministries throughout that community. One that stands out for it's continued commitment to the people of our nation's capitol is the DC Central Kitchen. For 20 years they have been serving delicious, nutritious food to their neighbors. Check out a recent article about the faithfulness of this ministry! Learn how YOU can partner with CSM in Washington DC and serve in ministries like the DC Central Kitchen! I love seeing how everything in God's plan works together and turns out. Proverbs 27:17 "Iron sharpens iron, so one man sharpens another." Today Austin’s and my group had a neat opportunity to see contrast and continuity all at the same time. This morning they started serving at Adult Day Services talking and spending time with senior citizens. They were amazed at the stories and wisdom that these people shared with them and at how fun it was to just be with them. Then in the afternoon they got to serve at a Boys and Girls Club and hang out with the 6-7 year old class. It went from quiet and structured to loud and chaotic. There was such a contrast in the age grouping and the volume and the energy that it almost seemed like we were serving in two completely different ways. But the continuity was there. Both places needed us to just be present and spend time with the people. In both cases we were not there to teach or bestow wisdom or do anything "special." We were there to be taught - whether it was the wisdom of the guests at Adult Day or the childlike innocence and abandon that the kids exhibit at Boys and Girls Club. It's easy to look at situations we are in as new each time. But today it was a good reminder to see that God gives us the tools to start conversations, connect, and love on people no matter where we are. We have to be willing to adapt and be flexible but He is our constant and doesn't make us start over every time. No matter where we are or who we are with, we have so much to learn. Psalm 71:18 "And even when I am old and gray, O God, do not forsake me, until I declare Your strength to this generation." 1 Timothy 4:12 "Let no one look down on your youthfulness, but rather in speech, conduct, love, faith and purity, show yourself an example of those who believe." I was at Harbor Light Salvation Army which is a drug and rehab center for men. They enter into 4 or 12 month programs and then they can either leave or go into the veterans program. They also have rooms for homeless men so that for 7 days out of 2 months, men can stay in the facility free of charge. They also provide a meal, free of charge, every night to men on the streets. Two days ago, while sitting at Harbor Light, watching the men pile in and my group working hard at serving, I saw a young man who looked as though he was in his mid-20's and could not have been homeless for long. My adult leader from my group this week talked me into going over and finding out his story. I was slightly hesitant, but I did and don't regret it. I went over to him, found out his name was Daniel and that he had only been homeless for a couple of weeks. He told me that he was in the army, came back with an alcohol addiction and then entered into the Star of Hope Men's program that is here in Houston. He had done so well in the program that they had hired him on after he had finished the program. He was a security guard making $15 an hour and dressing very sharply. He was very happy with where he was at, but one night several weeks ago, he went out and had some drinks and came into work drunk. They gave him a breathalizer test and fired him on the spot. He went home without a job and his girlfriend kicked him out within the next couple of days. He said that this isn't the first time he has been homeless, he said like 2-3 other times before as well, but didn't tell me what for. He left there and a couple of days later met up with a buddy who was begging him to go to a bar with him. Daniel reluctantly agreed but knew he couldn't go into the bar looking the way he did and carrying everything he owned in a bag, but his friend didn't seem to understand. They walked up to the bar and the bouncer stopped Daniel from going in. As he ashamedly walked away, a girl called him a loser. He was so affected by this because he then saw himself as lower than a human being. I told Daniel, as he was explaining to me the shame and lowered status he felt, that I was no better than him. He disagreed with me and I explained that although I may have a better circumstance than he, I am no better. I am a sinner just as he is and I mess up just like he did. We are all human beings and though status in the social world may be different, we as human beings are all made in the same image - that of our Heavenly Father. He said he was a believer and we talked about how he was depressed and didn't want to follow God but how he had just recently come to the conclusion that God is still good. It was awesome to hear his story and how he came to the conclusion that despite all of his trials and struggles of being homeless...GOD IS GOOD!!! It is SO true. I thank God for the experience He gave me to meet Daniel. He asked me to pray for him and I told him I would and that I would even pray for him right then. He was hesitant and then joyfully said "Yes, please". We've been hearing the statistics all over - the number of homeless kids in the US has skyrocketed this year. The NY Times just put out a fantastic article that truly puts a face on these statistics and brings this issue home. Learn how YOU can serve our homeless neighbors with CSM! This past week at CSM Toronto I was able to see the culmination of a summer of talking to one particular man. I was very blessed to be at St. Francis Table (a restaurant for the less fortunate) this entire summer. Since I was there nearly every day, I was able to talk to some of the regular customers on a daily basis. There is one man Jid (Gheed) that I purposefully talked to every time. When I first met Jid he did not speak much louder than a whisper, and everything he did say was very short. I realized he is a very kind man, but he is also very timid and is having many difficulties in life. Over time Jid told me little bits of his story and his personality began showing through in the small things he did share. He told me of a classical radio station that he enjoyed, and made sure that I had listened to it the next time I saw him. We were able to make jokes with one another about him wearing a wool sweater in the middle of summer. Jid even began asking for me if I was working in the back and he had not yet seen me that day; I felt honoured that he would do that. It saddens me that I will not be able to chat with Jid once I leave Toronto, but I also believe that this friendship we have built will have some lasting impact on both of our lives. Tonight was the first night of a girl's retreat my friend Brandi planned. She asked me to come and share with her girls and I am so glad Jesus made it possible for me to be here. It is just awesome to see Him already working and challenging these girls and there is still a day and a half left. To start off the first session I was telling these gals a little bit about my summer and everything God was teaching me when it hit me like a softball to the shoulder blade, quick and unexpected....I miss Nash. My eyes got teary and my throat clogged as the memories of the people there flooded me in a whole new way. I missed Nashville, specifically Daniel, Andy, Marshall, and Frank. They were treats this summer. As I talked about eating with them and learning how to enact scripture I couldn't help but wonder who ate with them this week. Did anyone talk to them? Are they still doing ok? Did Marshall find a full time job yet? I am so thankful to be here right now and know it's where God wants me but a huge part of my life is engrained with memories, lessons, and people from Nashville. And I love it. 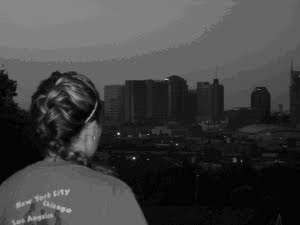 I love that my heart still aches and rejoices with that city. I love that even though I am states and states away I can have breakfast with a group that served in they city alongside me this summer. I am excited to have a chance to share with teenage girls the joy of serving in obedience and the struggles that come along with that joy. It was good to see Nashville come into another part of my life and get that chance to teach and apply what happened in my heart in Nashville in another place. It is a part of me. And now it's going to spread to some new states and cities and one by one (starting with me) the way we love people is going to change. Thanks Nashville for impacting me. And thanks God for not just stopping in Nashville. I spent yesterday morning serving at my last ministry site of the summer, but at one of my favorites. We went to an organization called God's Love We Deliver. At no cost the organization delivers nutritious meals terminally ill patients in their homes. It is available to anyone, rich or poor, with any life threatening illness from AIDS to cancer to MS to scleroderma (I just learned about that one yesterday). And so that brings me to Irene who I met on my group's delivery route yesterday. She was the last apartment on the route and normally I let my group go up to the apartment to drop off the food, but for some reason I asked if I could go up with the guy going this time. So we rode the elevator to the 12th floor and found her patiently waiting in the hallway for us. She was the most fragile lady I had ever seen. The scleroderma affects your skin as well as your organs like your kidneys, esophagus, heart and lungs. All of Irene's food has to be pureed and she has a tube in her throat because the food will harden as it goes down her esophagus and she won't be able to eat...So we round the corner and there is this tiny woman, skin and bones, waiting for us. Her eyes light up when she sees us and she gives us the biggest smile. She thanked us profusely and gave each of us a hug, telling us what a blessing the organization was and what a blessing we were for being willing to deliver this food. Irene asked us our names and where we were from and what school I went to and what I was studying. When she heard I was studying theatre she was so excited and that was her passion and she had been part of the Yiddish theatre (she was wearing her head scarf) as well as doing summer stock theatre in Connecticut, but she had also been a registered nurse. She was so interested to know about us and I wish that I had been able to talk to her longer and hear all about her life. But she thanked us once again and said she hope our that God blessed our lives and we said our goodbyes and headed back to the lobby. We don't always get to see the effect of what it is we are doing, but yesterday I got to see it. I am so glad I asked to deliver this meal and that I got to meet this sweet, precious lady who had such a positive outlook on life. I got to see one last time how God is working here in New York City. He knew just how to perfectly end my summer. Learn how YOU can serve with CSM on a urban mission trip! As I walk in, I am nervous. It is my first time at the Good Shepard Men's Shelter. Our directors had explained what it was like and what we would be doing. Simply sitting and talking with people at the morning drop in. This did not seem simple to me. Questions started furiously running through my head. Will anyone want to talk to me? What if we don't have anything to talk about? I quickly start praying for strength and courage from God to make this fast. As we went in we each got a cup of coffee or tea and then started looking around. My fellow hosts seemed to fall in easily. The fear starts to run through me again. I look around quickly and spot an older gentleman sitting alone at a table. I walk up and say hi with a smile and ask if I may sit with him. He reluctantly says yes and looks at me with bewilderment. I am already thinking this was not the table for me. I introduce myself and he follows saying his name is John. I slowly start the conversation thinking to myself how much he looks like my grandfather. His pants are too big and his shirt is much too large. As the conversation continues it begins to flow. I find out that he has cats and he goes on and on about them. I can see the joy across his face as he tells me their names and what they like to eat. We talk about why I am here and what I am doing in Toronto. We talk about his wife that passed and how he never had any children. And then the hour is up. It has flown by faster than I can imagine and I am wishing that I had another hour to sit and talk with this man. Little did I know that I would see John again. I see him about once a week at different sites all over the city. We sit and talk about his cats and what he has been doing since the last time I saw him. I have build more relationships just like this that I never would have dreamed of. I know that God placed me at the table to meet John that day, and I know that He gave the strength and courage that has helped me push out of my comfort zone this summer. I am so thankful for this and cannot wait to see what the rest of the summer has to offer. time in Toronto with CSM. I look forward to the things I’ll learn each new day, but also to where they are going to connect in my next season back home. A Houston man recently received an amazing gift - a second chance at restoring his life. With the help of a local lawyer, Charles was able to secure stable employment and watch his life get back under control. Love this video! One of the great things about spending a summer (or a week) with CSM is the awareness you gain from the experiences. To be able to invite someone to a banquet you have to know where they are. You have to know their address to send them an invitation or their e-mail for the e-vite or where they hang out so you can tell them when to meet. An invitation requires interaction of some sort. Today on our way home from church my friend Jenn and I stopped at Wal-Mart on the poorer side of town. I spotted a man walking along the street with a duffel that was dirty and packed full. We went inside and a dirty man with worn clothes and long hair was using change to buy a 24 pack. We went outside to see a guy packing his meager groceries in a worn, torn suitcase while he hunkered in the shade. We pulled out of the parking lot and watched a guy rummage through the garbage for cans (he had a whole wagon full). These men may not have been homeless. There is not a tell tale sign to spotting the homeless population. But they visibly had less than I did. They visibly looked worn and tired. And I hate to admit it, but I’m not sure I would have noticed them all the way I did today this time last year. I felt conflicted when I saw them. Partly because I should have noticed them last year. Partly because I wanted to talk to them. Partly because I didn’t want to talk to them with my church clothes on. Partly because there was no smooth way to approach any of them without it looking like I had pegged them for a homeless person. This summer can’t just be this summer. It has to make me aware and active where I am now, and talking to these guys whether they are homeless or not is a big part of that. I came into the summer desiring to love a forgotten demographic and I need to go into this school year loving that demographic and inviting others to join me. So I think Jenn and I are going to go hang out downtown some evening. Have some conversations, find a new Daniel, love the way Jesus would. I want to invite them to a banquet….even if it’s just a banquet of pb&j. The LA Times recently ran an article about a priest offering therapy to troubled teens in South Los Angeles. The sessions allow these young adults to release bottled up emotions and experiences. Please pray for this very necessary ministry!